Recently I reviewed Body Champ Power Tower, which is multi-functional and got a lot of attention. So I took the liberty to look for another such tower and landed on Body Power Multi-Functional Power Tower. 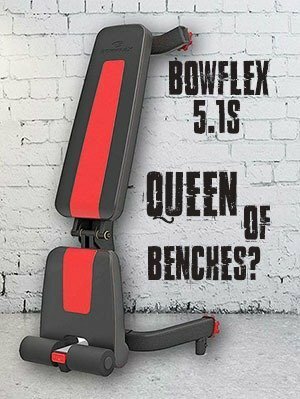 Body Power is one of the leaders in fitness equipment industry and makes all sorts of things, such as power towers, adjustable weight benches, power racks, half racks, exercise bikes and so on. But now we will focus on the power tower only. 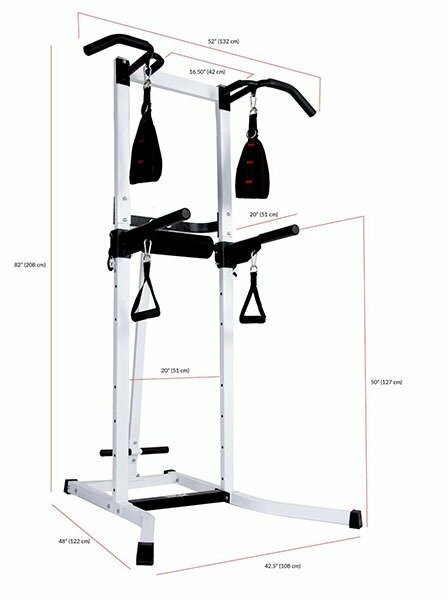 Body Power tower is made of sturdy steel and comes with a lot of features. First thing to note is that it does not have pull up bar, only pull up and chin up grips. Included are heavy-duty dip bars mounted on adjustable horizontal bars. Another great addition is adjustable and removable high density PU foam roller backpad. The body power multifunctional power tower also comes with abdominal sling straps, hanging handgrips and sit-ups bar. The tower’s dimensions are 48L x 48.5W x 82H inches and the weight is 85.8 lbs. Maximum support weight is set to 300 lbs. Since the tower was already assembled when I tested it, I can only take the online reviewers’ info. The assembly is pretty straightforward with the included manual and it took most users an hour. However, multiple users reported that the packaging was not good. In most cases it came battered and the Styrofoam inside was pretty shredded. Body Power guys should take a better look at their packages. Firstly, the entire construction is indeed sturdy and I especially like the wide-designed base, which is a good anti-wobble solution. Second thing that I need to mention is the sling straps and hanging handgrips. Considering they were included with the tower, I kind of expected them to be of low quality. This is not the case. They are quite durable and well-padded. Regarding pull-up grips, they’ve done a great job that you can do standard, wide and chin pull ups. However, if you are a bar user, you will miss it, since this tower does not provide it. Regarding dip station, I must say that the circumference is larger than in most power towers. This is a plus for me and anyone with bigger hands, as it does not wear your hands down quickly. Even people with smaller hands will find this difference welcoming, as it is more comfortable. The removable and adjustable high-density PU foam roller is quite comfortable, but I must say it is quite narrow, which is a minus if you are a bigger guy. Another great addition is the sit-up bar, which can be used for sit-ups and crunches. I don’t have much to add here, the bar is pretty standard. One thing that I miss though, are the push-up bars, which are usually attached at the base. 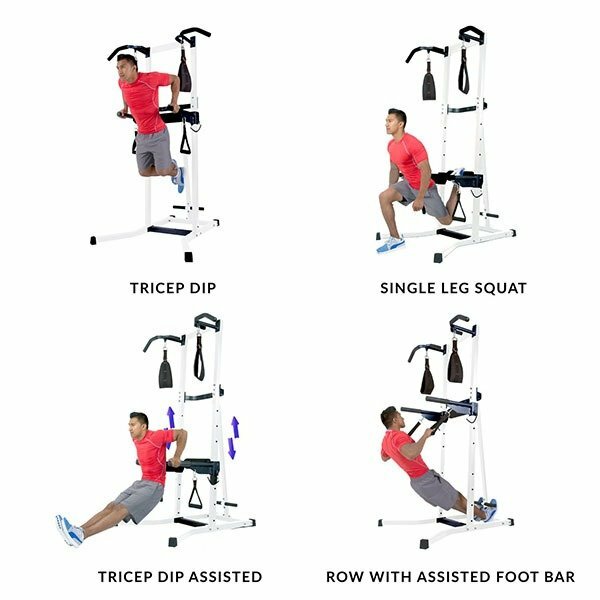 This is not the case with Body Power Multi-functional power tower, however, you can use adjustable dip bars for inclined push ups, as they state.